We are presenting a simplified alternative method for dispersive liquid-liquid microextraction (DLLME) by resorting to the use of surfactants as emulsifiers and micro solid-phase extraction (μ-SPE). 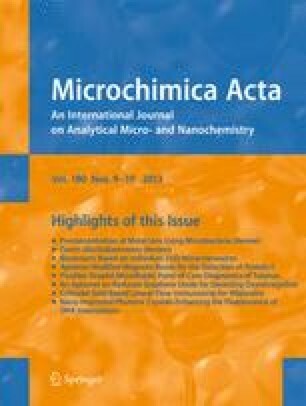 In this combined procedure, DLLME of hydrophobic components is initially accomplished in a mixed micellar/microemulsion extractant phase that is prepared by rapidly mixing a non-ionic surfactant and 1-octanol in aqueous medium. Then, and in contrast to classic DLLME, the extractant phase is collected by highly hydrophobic polysiloxane-coated core-shell Fe2O3@C magnetic nanoparticles. Hence, the sample components are the target analyte in the DLLME which, in turn, becomes the target analyte of the μ-SPE step. This 2-step approach represents a new and simple DLLME procedure that lacks tedious steps such as centrifugation, thawing, or delicate collection of the extractant phase. As a result, the analytical process is accelerated and the volume of the collected phase does not depend on the volume of the extraction solvent. The method was applied to extract cadmium in the form of its pyrrolidine dithiocarbamate chelate from spiked water samples prior to its determination by FAAS. Detection limits were brought down to the low μg L−1 levels by preconcentrating 10 mL samples with satisfactory recoveries (96.0–108.0 %). The online version of this article (doi: 10.1007/s00604-013-0987-6) contains supplementary material, which is available to authorized users.